IT IS always such a pleasure to run into our genial old mate and owner driver Bruce Allright from Launceston, and so it was the other day when he rolled into the Caltex at Epping Forest looking for a good hot cuppa. Bruce was driving his 2000 Mack Magnum (the original French Connection) with a 620 Cummins up the front and towing a B-double on his way from the ferry at Devonport to do supermarket deliveries around Hobart and was anxious to get on his way to avoid the curfew. 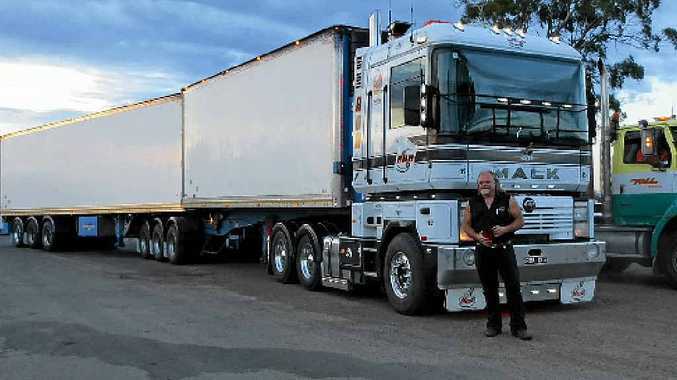 He tells us he has been in business and driving trucks since he was a pup, which is how most Mack drivers start out, and reckons it is getting tougher nowadays requiring a lot of hard work and having the smarts to do everything right, and a bit of good luck here and there helps as well. We could tell the Boss was driving this truck as everything was detailed and gleaming and 'smick as'.